We might be in the very last wave of this Primary wave before the market starts to collapse. 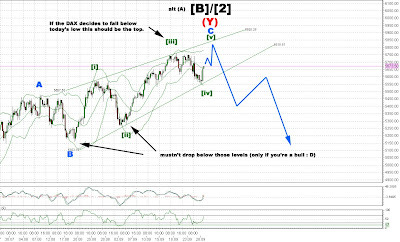 SPX: Last weekend, I wrote that I expect a correction from higher levels. This actually happened; the market moved higher till Wednesday, corrected after the FED announcement and nearly reached the wave [i] high @1040. DAX: The DAX is making a really nice Ending Diagonal (ED). So far, I can only count 4 waves, thus I expect a last a-b-c move to the upside to complete the ED. After that, this rally should be over and we should see new lows next year. USD: I think the USD has bottomed and is now ready to take-off : D. As you can see in my last post about the USD/CHF I preferred the 1,02 area as a possible bottom. It reached 1,0188 last week, thus I think the low is in. This count will be correct as long as it doesn't make new lows.